If you are a running a SaaS business it can be tempting to try and automate as many aspects of it as possible. But if you want to build a business that will last, customer communication is something you should manage personally. What follows is a guest post from Sahil Parikh, founder of Brightpod, cloud collaboration software that takes the chaos out of managing digital marketing projects and helps marketers focus on what matters. Back in 2013 we were researching support options for Brightpod and checked out Zendesk, Desk, HelpScout and FreshDesk. All of these were fantastic tools and we almost went with one of them until we came across Intercom. At that time Intercom positioned itself as the CRM tool for SaaS companies which would help us get to know our customers better. That seemed quite different to the other tools we looked at but that emphasis on personal communications resonated with us. Running a web business can be impersonal since you never see your customers face to face. But it was essential to the success of our business that we understood our customers and built a strong relationship with them. In the intervening period, Intercom has become an integral part of running Brightpod. After using Intercom for just a month we realized it was built around our customers – who they are, what they are doing, where they come from, the previous contacts they have had with us etc. The biggest benefit for us is that it helps us give meaning to the conversations that we have with our audience. At Brightpod, we use Intercom in six distinct ways. 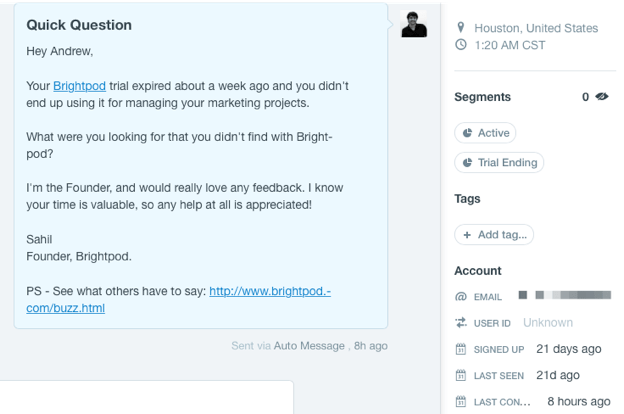 When a person is on the trial period we send them smart auto messages that helps them get more out of Brightpod. When we see a person that is using the tool frequently we send them an in-app message with a link to our video tutorials. The goal here is to convert this person from a casual user to a power user. Understanding how people use your product is key. More importantly, sending personalised, targeted emails is paramount today. 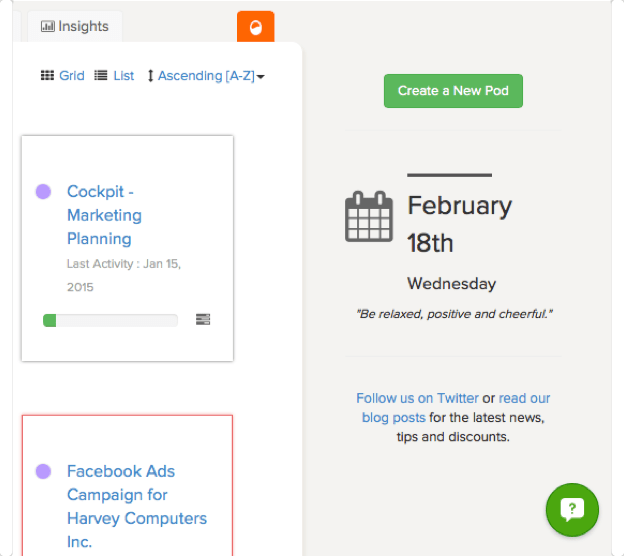 To date we have successfully on-boarded 4,600 companies on Brightpod using Intercom. I am addicted to the daily signup email I get from Intercom at precisely 7:30am. It shows me who signed up yesterday and where they are from. You don’t have to program this as a cron job anymore! Last month, someone from UNC Chapel Hill (my alma mater) signed up to Brightpod. I quickly emailed them a hello and we exchanged a few emails. A few days later they upgraded their account and now they are a paying customer. 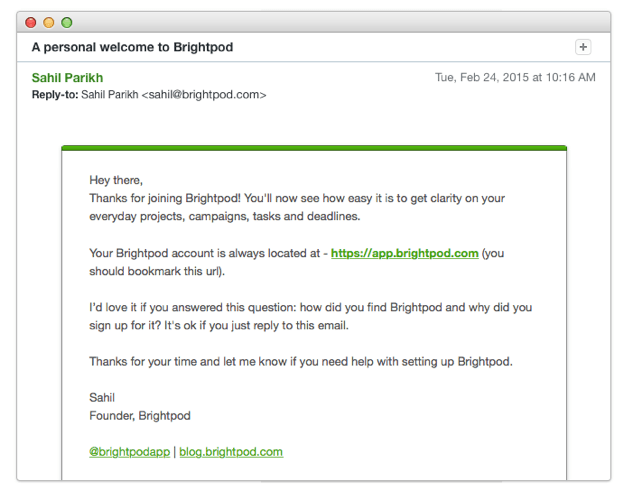 I often ask people how they found us and why they signed up for Brightpod. This email has an open rate of almost 50%. 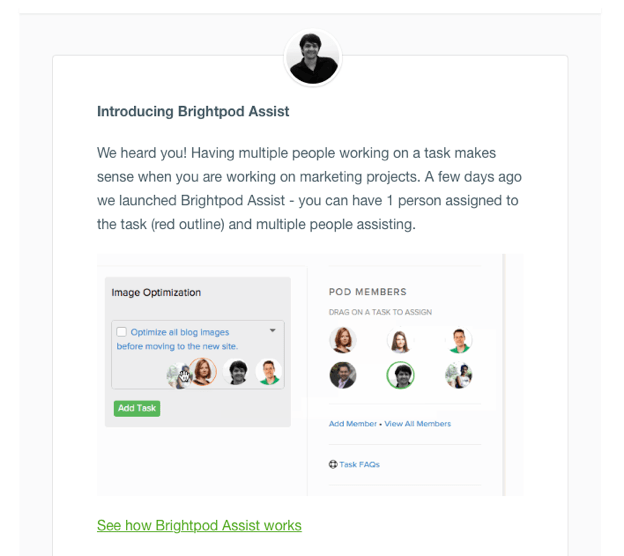 The beauty of this email is that it’s simple, targeted and moreover I have enjoyed reading their replies on how they found Brightpod (what they searched for) and why they signed up. The latter is one of the most important questions you can ask a prospective customer. We send our monthly newsletter to all our users from Intercom. This helps us save a few hundred dollars that we would have probably spent on maintaining a Mailchimp account. I sometimes even send out personal messages to different segments of our customer base. This one is after the polar vortex that happened in December 2013. I searched for everyone in the effected areas and sent them a personal email. The response rate was phenomenal – 80% opened the email and 60% replied back. Before Intercom, we had to program this into the app and make sure a developer was free to get the “here is a new feature popup” integrated. Now, its a marketers job and takes only a few minutes. This ran for two weeks at the end of last year and people only saw it when they were on the Tasks page inside their projects. We had 12% of the people who saw it click through to the tutorial link. Thanks to Intercom we now have meaningful conversations with our customers instead of labelling each incoming email as a ticket. Each message is a way for us to build that relationship in a SaaS business. Since it knows a lot about our customers it only makes sense that we have some context before we reply to a customer. The other day I had a very happy customer contact us and I could see she had a big following on Twitter. This prompted me to ask her if she would recommend Brightpod to her followers. Other times, when customers complain we first check their account details and past conversations in Intercom and then give a meaningful reply instead of something canned. Intercom is saving us a few hundred dollars (we would have to purchase support and email marketing tools but now we get that functionality on a single platform) and 10-15 hours every month. But even more importantly it has got us closer to understanding our customers and given us a deeper insight into what they are doing in our product. SaaS business owners can automate various parts of their business but building relationships with the people that matter is still something you need to do manually with the right tool. We are indebted to the team behind Intercom. They have built something fantastic that allows us to keep the focus of our business around people.